Description WILL NOT LAST! SALSA RED METALLIC exterior and LIGHT GRAY CLOTH interior, LT trim. PRICE DROP FROM $6,998, EPA 25 MPG Hwy/19 MPG City! Aluminum Wheels, WHEELS, 4-17" X 7" (43.2 CM X 17.8 CM) CAST ALUMINUM, CD Player, All Wheel Drive, ENGINE, 3.4L 3400 V6, SEATS, FRONT RECLINING BUCKETS, WHEELS, 4-17" X 7" (43.2 CM X 17.8 CM... TRANSMISSION, 5-SPEED AUTOMATIC, ELEC... AND MORE! 5 Star Driver Front Crash Rating. 5 Star Driver Side Crash Rating. Child Safety Locks, 4-Wheel ABS, Front Disc/Rear Drum Brakes Safety equipment includes Child Safety Locks Chevrolet LT with SALSA RED METALLIC exterior and LIGHT GRAY CLOTH interior features a V6 Cylinder Engine with 185 HP at 5200 RPM*. WHEELS, 4-17" X 7" (43.2 CM X 17.8 CM) CAST ALUMINUM includes steel spare, SEATS, FRONT RECLINING BUCKETS (STD), TRANSMISSION, 5-SPEED AUTOMATIC, ELECTRONICALLY CONTROLLED (STD), ENGINE, 3.4L 3400 V6 (185 HP [138.0 kW] @ 5200 rpm, 210 lb.-ft [283.8 N-m] @ 3800 rpm) (STD). SERVICED HERE! Non-Smoker vehicle, LOCAL TRADE-IN! JUST ARRIVED. BETTER HURRY! LOCATED IN RUSHVILLE! CALL TODAY 877-725-3003. Edmunds Editors' Most Wanted SUV Under $25,000. 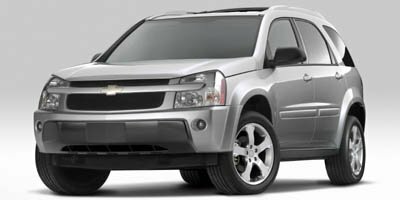 Edmunds.com explains "A roomy and versatile cabin, excellent crash test scores and decent fuel mileage make the attractively priced Chevrolet Equinox one of the better choices in the compact SUV field.". Great Gas Mileage: 25 MPG Hwy.